One common way to achieve this is via Excel’s Workbook.AfterSave (or Workbook.BeforeSave) event. Every time you hit “save” in Excel, some VBA code is executed and saves a copy of your workbook’s VBA content to the filesystem. You end up with your VBA files alongside your workbook which can then be pushed to your Git server. There are a few downsides to using Excel events. You are dependent on Excel, so if you copy your workbook from an email or another folder into your Git repository folder, your VBA export function will not run. Distributing the export function (either via copy and paste or as an Addin) and ensuring it runs reliably is another pain point. We use the Python package oletools to extract the VBA code from the Excel file (in fact, this works for any MS Office file). Thus, we no longer have to resort to Excel itself to get hold of the VBA code. Our script requires Python 3 and oletools. oletools can be installed via pip, Python’s package manager: pip install -U oletools. KEEP_NAME = False  # Set this to True if you would like to keep "Attribute VB_Name"
This Python script finds any Excel files that can contain VBA and dumps the content into a subfolder named src.vba. Note that this script works unchanged if you only use 1 workbook. If you have more than one Workbook in one repository, you’ll need to replace vba_path = 'src.vba' with vba_path = workbook_path + '.vba' and edit your pre-commit file below accordingly to have a git add -- ./<workbookname>.vba line for each of your workbooks. Note: On Mac you need to run chmod +x .git/hooks/pre-commit, otherwise it will not trigger the hook. From now on, when you execute git commit, the hook extracts the VBA code and adds it to your commit. 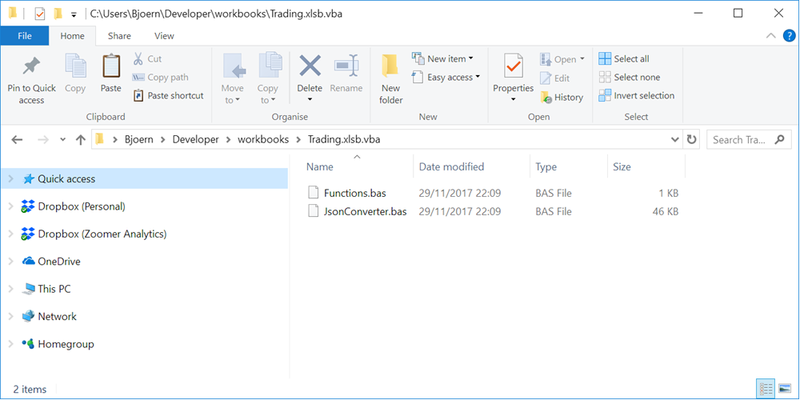 You automatically end up with the .bas files without having to rely on Excel. With that in place, any git commit automatically takes care of dumping your workbooks VBA content as text files to your filesystem. Which is something that Git understands well. If you are less of a DIY person, I recommend checking out our free, open-source xltrail client. Instead of having to rely on a workaround, xltrail client is a Git extension that integrates directly with Git and makes git diff work with Excel workbook files. 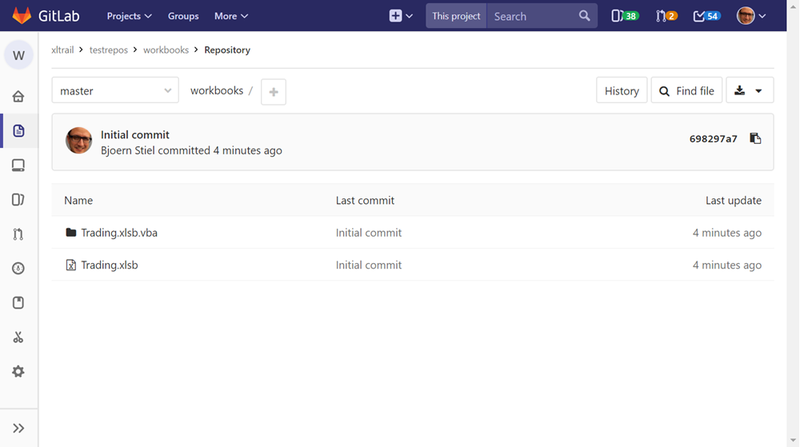 It also supports git merge for those instances where your colleague works on the same workbook and you need to merge their changes in. Plus, xltrail client goes a step beyond the VBA-only approach and also understands sheets. For installation instructions, docs and an example video, check out the docs and the GitHub repository.